So, to continue this series of conversations, here are Kirk Simon and Karen Goodman, directors/producers of Strangers No More, which is nominated in the Documentary Short Subject category. land while slowly opening up to share their stories of hardship and tragedy. With tremendous effort and dedication, the school provides the support these children need to recover from their past. Together, the bond between teacher and student, and amongst the students themselves, enables them to create new lives in this exceptional community. Kirk Simon: I studied film at Hampshire College; my classmates included Buddy Squires and Ken Burns. I spent as much time working in still photography as I did in film. Karen Goodman: I began making films when I was 14--I attended an arts camp in the Berkshires and made my first film there with a Super 8 camera my father gave me. In high school I worked after school as an intern at Public Access TV, where we used 1/2 portable video--“portapak"--to cover events. IDA: What inspired you to make Strangers No More? tell. The school is truly a place where education conquers all. KG: The moment I set foot in the school, I knew there was an important and inspiring story about the possibility for peace and tolerance through education that had to be told. The children's message of hope--despite the trauma of their backgrounds--captured my heart. or two trips. It took many months to gain the confidence of the children in the school. KG: Gaining the trust of these fragile children was a challenge. Many had come to the school orphaned; some had witnessed the execution of their parents in wartime; nearly every child, as the principal Karen Tal says in the film, "was running away from something." It took time to gain the trust of the teachers, who were understandably protective, and for the students to share their stories. We made at least half a dozen trips to Israel, and before long [the teachers and students] began to miss us when we weren't there. KS: I don't think my vision changed during the production of the film; it was simply difficult to capture the heart-wrenching stories of the children who attend the school. So it was more a matter of trying to achieve what one thought was possible. KG: The film did not change dramatically, but rather was a process over time in which we began to focus on three particular kids whose stories we felt rendered an image of this amazing community. 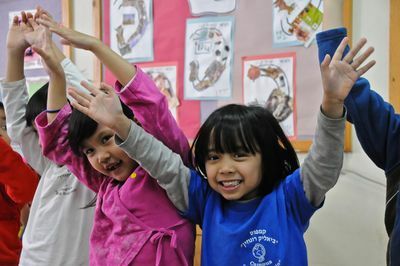 We wanted to find a new student and follow the experience of coming to the Bialik school with no academic background whatsoever and watch him or her grow. At the same time, we wanted to follow the story of an older student whose life had been changed. So over time, we discovered these stories. It wasn't until the very end of the editing process that we decided to use very limited archival footage to give a sense of the context of the students backgrounds. IDA: As you've screened Strangers No More--whether on the festival circuit, or in screening rooms, or in living rooms--how have audiences reacted to the film? What has been most surprising or unexpected about their reactions? stories that come from Israel are ones of conflict and war, so a story of educators coming together to help kids is an unusual one. KG: The reaction to the film has been inspiring. In Israel it has been front-page news. Elsewhere, people and organizations have come forth wanting to know how they can help the school and donate funds, and there has been lots of interest in the educational world about using Bialik as role model. KS: I was sitting in my apartment in Manhattan. I had watched the morning news shows where the major categories of the Oscar were announced. I then went to the AMPAS website and started to hit the refresh button. It wasn't long before my phones were ringing and I was receiving texts like crazy. I knew it must be good news. KG: I was sitting in New York City looking out at Central Park, awaiting the moment when the Internet would bring the announcement…Trembling. KG: All of the "gods" of cinema vérité--the Maysles, Richard Leacock, DA Pennebaker. Also a lesser known Canadian filmmaker, Mike Rubbo, whom I took a workshop with many years ago. His film Waiting for Fidel--about an interview he was sent to Cuba by the CBC to get, but never did--had a huge impact on me. Also, all the great documentary photographers from the Farm Security Administration--Walker Evans, Dorothea Lange--and those from the Photo League including my mentor, Jerome Liebling. Strangers No More will be screening Saturday, February 26, at 9:00 a.m. as part of DocuDay LA at the Writers Guild of America Theater in Beverly Hills, and Sunday, February 27, at 1:30 p.m. at DocuDay NY at The Paley Center for Media in Manhattan.